This originally appeared on our old blog site on 10 December 2012. Plagiarism has been on my mind quite a bit lately. Before you read the rest of this post be advised I am not, repeat not, a lawyer of any persuasion. Also be advised that this post contains opinion and if you’d rather not read my thoughts on copyright, stealing content, and creating your own content, then move on. This post is not about copyright law and about what is legal and what is not.It’s not about what constitutes fair use. Those are important topics, but I’m not a lawyer and I don’t play one on the Internet. Plagiarism, and the blatant passing off as your own something that is not, irritates most writers and content creators. Their frustration with these “copiers” has little to do with the law even though it is designed to protect them. It has to do with what is right and with what is just. Copying someone else’s stuff is cheating pure and simple. There are laws to protect the copyright of content creators. The problem is that it is not easy nor is it cheap to enforce legally enforce copyright and to obtain a judgement against violators. Even if you are clearly in the right. Content thieves are not all stupid. Content thieves are lazy, but laziness does not equal stupidity. They are smart enough to figure out how to steal content and lazy enough to not create their own. Content thieves play off fear, ignorance, and a stark financial reality. 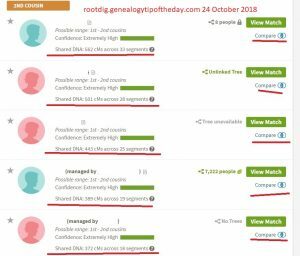 The majority of individuals generating genealogical content on blogs and in other media are not well-heeled. They do not have intellectual property attorneys on staff that they can simply sic on the violators. Hiring an attorney to write a “cease and desist letter” on letterhead is not cheap. Court is worse. Enforcing copyright in a court of law takes serious money that writers generally use to support their business and their families. Some bloggers and writers only do so “for fun,” making the expense of legal fees even more of a problem. Enforcing copyright takes time away from generating income for those who use their content to support themselves. Content thieves know this. Fighting these battles takes time away from the “for fun” bloggers and may even make some of them stop blogging entirely. And that’s a loss to those who use the work of these content creators in an honest and ethical fashion. The content thieves feed on a forced inertia on the part of many content creators. They also rely on the fact that most content creators never discover the use of their material. The typical genealogist who wants to avoid problems when using someone’s “information” should simply ask if they can use it. Most of us don’t mind as long as we are quoted verbatim and in context. Of course, facts cannot be copyrighted, but we’re not talking about simple facts here. We are talking about using someone else’s sentences or paragraphs and passing them off as your own, without credit. Using a few sentences, including a citation to the original, usually is not a problem. Copying even a sentence that is not yours and using it verbatim may not exactly put you at a major risk, but it makes you look like you can’t create your own stuff. Play with the big girls and boys and create your own content. In 1847, sick of Ohio and desiring to leave their relatives behind, the Rampleys moved west to Adams County, Illinois. In 1849, sick of Adams County, Illinois, and the few relatives who had moved there with them, the Rampleys moved to Walker Township. This is where they stayed because Elizabeth told James if he got sick of any more places or any more relatives, he could get sick of her as well and leave her behind. Maybe the second example is not quite the best (unless Elizabeth’s diary confesses such things to the reader). Using a variety of records and sources and a little common sense, you could have sentence or two that reflects your unique style more than the original sentence that was copied. And you haven’t violated anyone’s copyright. And you’ve generated your own unique content. The same is true of images on the Internet. If you did not take the picture, it is not yours to use as you will. Period. It does not matter if it is your great-grandmother’s tombstone which your great-great-grandfather carved himself. You did not take the picture. The taker of the photograph may not care if you use the photograph, but contact them and ask first. It’s really pretty simple–if you did not create it, ask to use it. Don’t use it if the person tells you “no.” The creator has the right to tell you “no” that you cannot use their material. Most will allow it. Perhaps your parents used the same word once upon a time (or maybe they should have). When told “no,” put on the big-boy pants and move on. Research the people and the places yourself and create your own content. You may discover something the original author didn’t know or write better prose. Don’t want to spend all that time doing research? Then get a different past time because that’s what genealogy is–research. Some genealogists have an emotional attachment to the ancestors that they write about–when you steal the words they wrote about their great-grandmother it bothers them more than if they were simply reporting on the weather or the national deficit. Although writing about the deficit may make them cry for different reasons. And the argument that “it’s on the Internet, I can use it no matter what” does not hold water. Using what you did not make is not correct. It is as simple as that. That “it’s online, I can use it” argument is a sieve through which all water passes. Some content creators use income from their writings and blogs to support themselves and their families, augment their income, or support their genealogy habit. For some the loss of income makes it difficult for them to do that. The “loss of income” is one reason why copyright was created. But many do not generate the sort of revenue required to take the legal action to protect their copyright. Copyright also exists so that people can exercise control over the use of their creative material and even choose to not have others use it. If you didn’t create it–don’t use it so that others think you did. We’ll be posting a future update on what you can do when your copyright has been violated, without necessarily breaking the bank. There are no guarantees, but most “violaters” are using a hosting service, a “cloud,” or some company to host their content. Often that host does not want to be known to host copyrighted material. I’m done—time to create some original content. There are very few people I would steal from, and unfortunately, they would know that I did it and know how to “deal with me appropriately,” so I’m stuck creating my own!